Why Are Idioms so Tough for Students to Understand? I’ve been teaching for over 25 years–7 years at the elementary level, and the rest at the high school level. Year after year I find that students have a tough time understanding idioms. They know that the idiom is not supposed to be taken literally, but they’re just unsure about the meaning of any given idiom. When I think back to how I learned about idioms, I can’t pinpoint any given source, but I think that I definitely learned idioms from my reading. I must have also learned idioms from hearing adult conversations. I’d even wager to say I learned some idioms from watching TV! I’m not so sure students are spending enough time listening to the adults in their lives. Maybe they’re just not taking note. I wish I had the answer. There are very common idioms like, “It’s raining cats and dogs,” and “None of your business,” but there are so many others that are beyond the grasp of most students. Some examples are, “Cut the mustard,” “Back to the drawing board,” “I’m on cloud nine,” and so many more. So what happens? I’d love to say that students look up the meaning of those idioms online as they’re reading, but many are not taking this seemingly easy step. They just keep on reading. Now, in many cases, this might be Ok, but in some cases, idiom meaning is integral to comprehension. I’m determined to help my high school English students learn a few more idioms! I’ve developed maker station task cards designed to get kids thinking about idioms in a creative way. 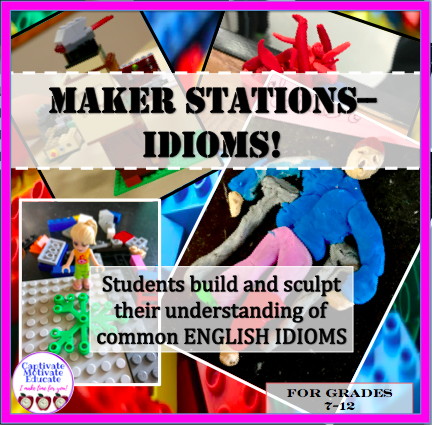 Students will use modeling clay and LEGOS to visually depict idioms such as, “Back to the drawing board,” “Break a leg,” and “Dime a dozen.” Students will take photos of their finished creations, and they will also have to describe their creation, and explain the meaning of the idiom. When students use their hands to think creatively and critically, they will remember the information a lot longer. Check out this creative product in my Teachers Pay Teachers store. I look forward to hearing about how your students enjoy these maker station tasks. What a creative idea for helping students learn about idioms! With my 5th/6th graders, I used to have laminated cards printed with idioms and sayings and with a partner, they had to act them out for others to guess! So fun! I think you’re right. Idioms are difficult to understand. I think we tend to learn most of them by osmosis, but without exposure that is impossible. If it is difficult for native English speakers, I’m sure it’s incredibly difficult for English as another language learners. Good on you for noticing the difficulty and doing what you can to rectify it. Thanks so much for your comment, Norah. I wonder if other languages have as many idioms as the English language?